After enabling claims-based authentication, the next step is to add and configure the claims provider and relying party trusts in AD FS. You need to add a claims rule to retrieve the user principal name (UPN) attribute from Active Directory and send it to Microsoft Dynamics 365 as a UPN. On the server running AD FS, start AD FS Management. In the Navigation Pane, expand Trust Relationships, and then click Claims Provider Trusts. Under Claims Provider Trusts, right-click Active Directory, and then click Edit Claims Rules. In the Rules Editor, click Add Rule. In the Claim rule template list, select the Send LDAP Attributes as Claims template, and then click Next. Click Finish, and then click OK to close the Rules Editor. After you enable claims-based authentication, you must configure Microsoft Dynamics 365 Server as a relying party to consume claims from AD FS for authenticating internal claims access. In the Navigation Pane, expand Trust Relationships, and then click Relying Party Trusts. On the Actions menu located in the right column, click Add Relying Party Trust. On the Select Data Source page, click Import data about the relying party published online or on a local network, and then type the URL to locate the federationmetadata.xml file. This federation metadata is created during claims setup. Use the URL listed on the last page of the Configure Claims-Based Authentication Wizard (before you click Finish), for example, https://internalcrm.contoso.com/FederationMetadata/2007-06/FederationMetadata.xml. Verify that no certificate-related warnings appear. On the Specify Display Name page, type a display name, such as Dynamics 365 Claims Relying Party, and then click Next. On the Configure Multi-factor Authentication Now page, make your selection and click Next. On the Choose Issuance Authorization Rules page, click Permit all users to access this relying party, and then click Next. If your identifier differs from the above example, click Previous in the Add Relying Party Trust Wizard and check the Federation metadata address. 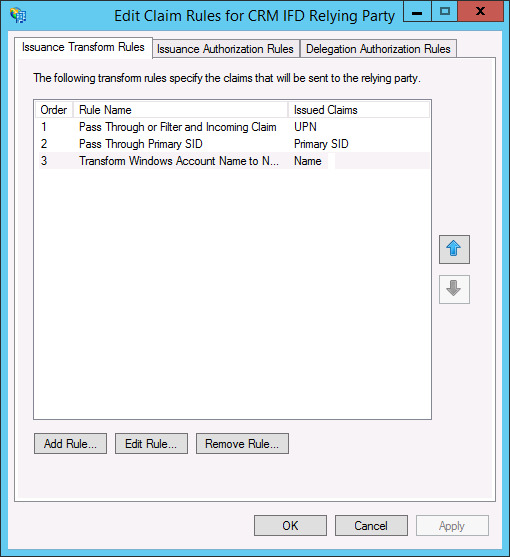 Be sure the Issuance Transform Rules tab is selected. In the Claim rule template list, select the Transform an Incoming Claim template, and then click Next. This illustration shows the three relying party trust rules you create. The relying party trust you created defines how AD FS Federation Service recognizes the Microsoft Dynamics 365 relying party and issues claims to it. 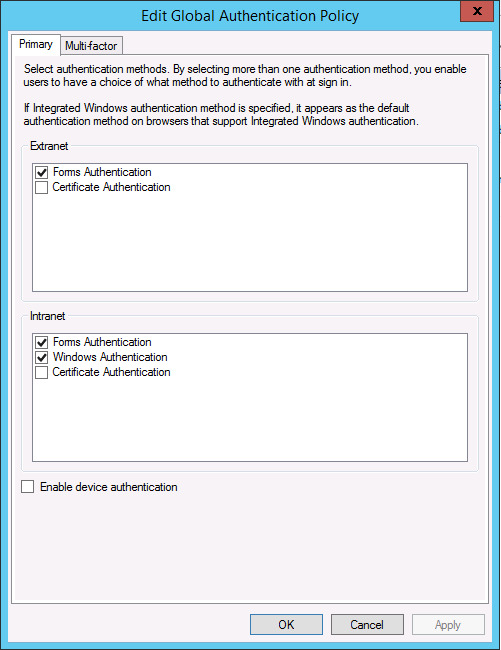 In AD FS in Windows Server 2012 R2, forms authentication is not enabled by default. Open the AD FS management console and click Authentication Policies. Under Primary Authentication, Global Settings, Authentication Methods, click Edit. Under Intranet, enable (check) Forms Authentication and then click OK.